I’ve been back on my dessert kick lately. Every weekend I make and sample several treats. While normally my treats are fairly intricate and take over an hour to make, I’ve been making adorable but easy desserts in recent weeks. This one is no exception. 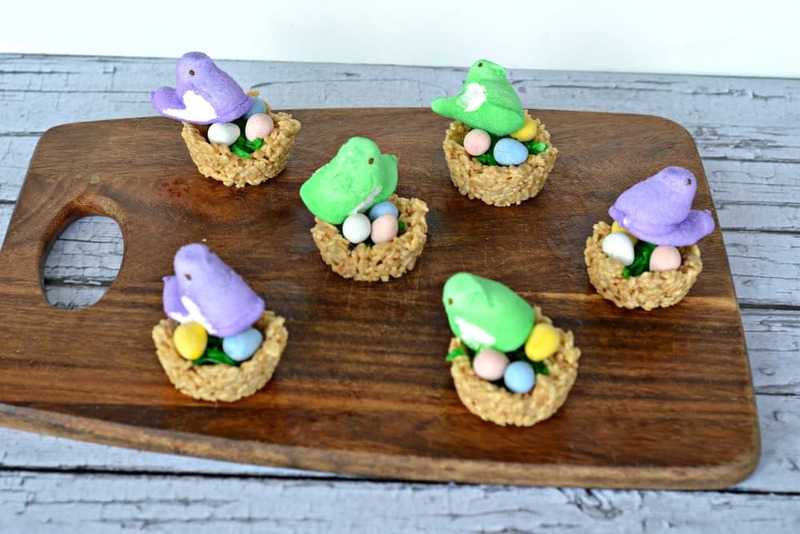 With Easter only days away if you are looking for something special to serve for dessert but you don’t have a lot of time, I’ve got the dessert for you! 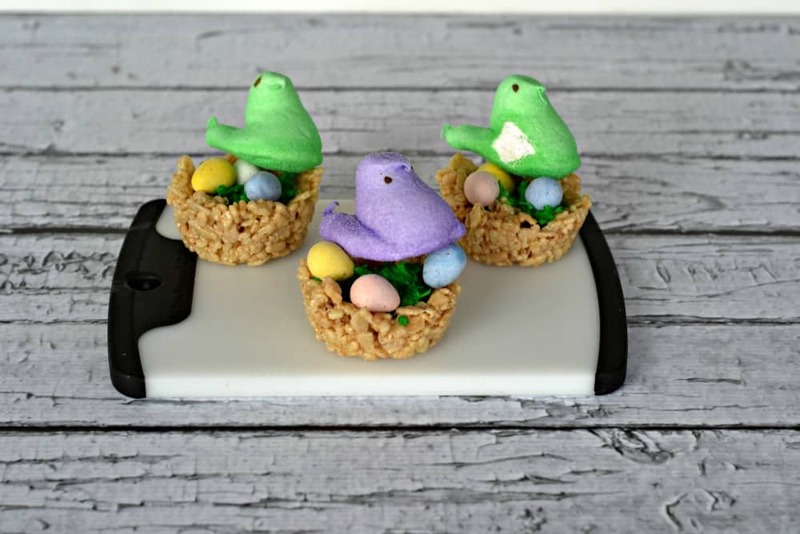 The Rice Krispies Treats nests filled with speckled chocolate eggs and Peeps take less then 15 minutes to make and put together yet they are super adorable! 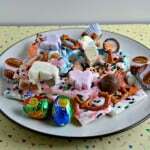 I actually ended up using several different bags of marshmallows that I had laying around. 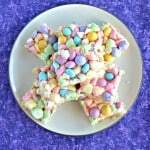 I had half a bag of mini marshmallows and about a cup of these Easter Bunny Mallows . I put both in the pan and even though one bag was colored marshmallows it didn’t affect the end product at all. 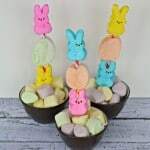 Once the nests are made, kids can help assemble then by putting in the coconut “grass”, the chocolate eggs, and placing the Peeps on top. 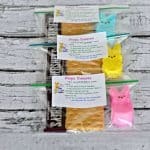 It’s a great activity for them while you are trying to get Easter dinner cooked and the kids will love them! Place the coconut and green food coloring in a zip top bag. Zip closed and shake to color the coconut green. Set aside. Spray a muffin tin with cooking spray. Set aside. Heat the butter in a large saucepan over medium heat. Add in the marshmallows, stirring constantly, until they have melted. Remove from heat and stir in the Rice Krispies. Quickly place a spoonful of the mixture into each of 12 muffin cups. 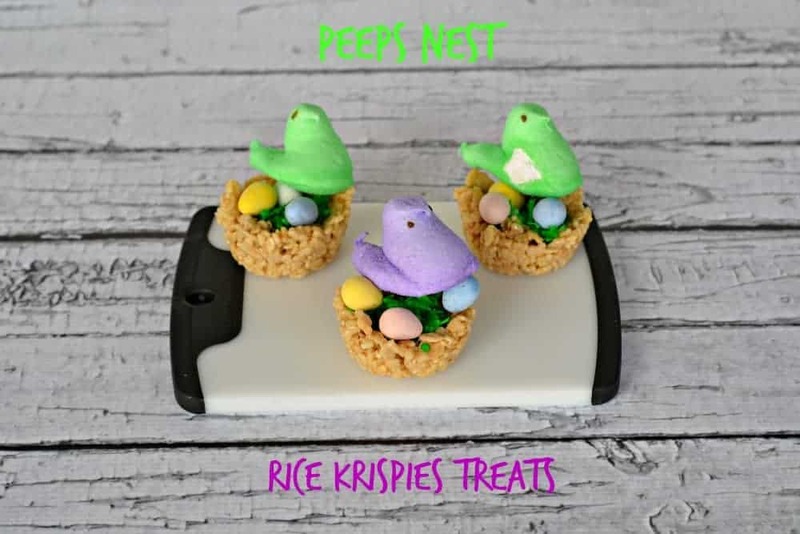 Spray the back of a spoon with cooking spray and quickly press in the middle of each Rice Krispies treat to form the nests. Allow to cool for 10 minutes. Remove the nests from the muffin tin. Sprinkle the coconut in the center of each nest, place 3 chocolate eggs in the nest, and put a Peeps on top.